Yes, those are my feet, at 7:57 a.m., this morning. Those feet are supposed to be at the gym right now, but I’m giving myself the week off from a schedule. I’m getting so much done! All the things that fall through the cracks, when life goes too fast. But, back to the story! This morning, doing what I love to do, cruising the Land of Blogs, checking out DIY projects, I met Paige, at A Junk Chick Life. 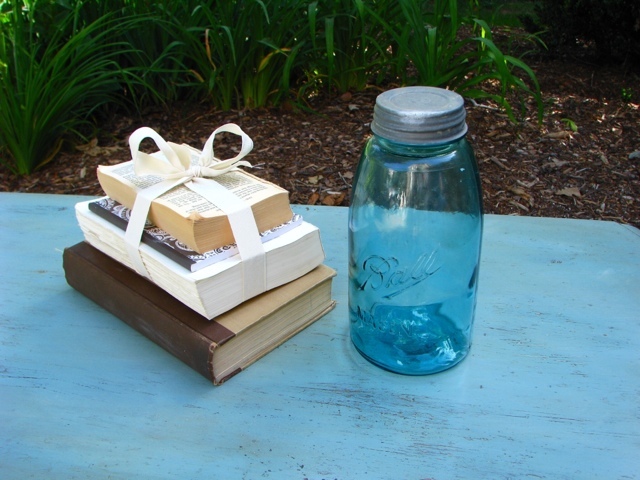 She lives in Asheville, North Carolina and her rule for DIY projects is to never pay more than $5 for a paint project. She broke the rule on this one…and spent $10! All for good reason! 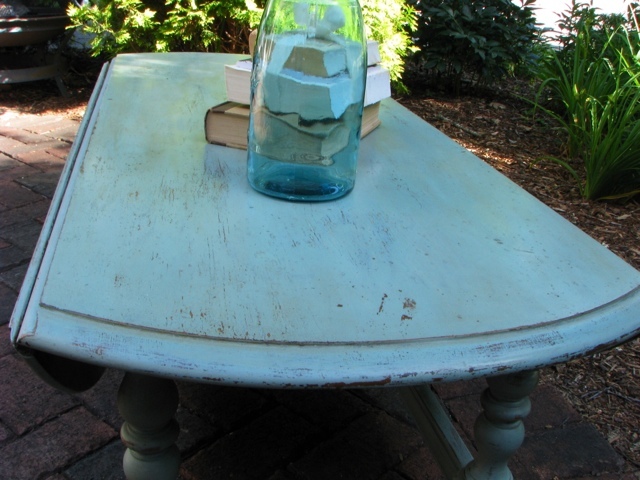 See what she did with Miss Mustard Seed’s Milk Paint, in Eulalie’s Sky, a pretty Aqua color! You know, I’m a big fan of The $5 Fill-In-The-Blank. Meaning I DO NOT like to pay over $5 for ANYTHING I’m going to paint. So if I do pay over $5 it has to be something pretty cool. How could I not? 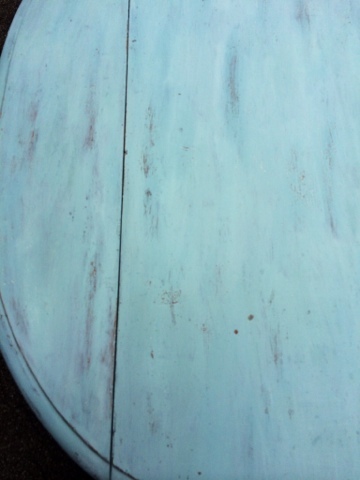 It’s in the Turquoise family. 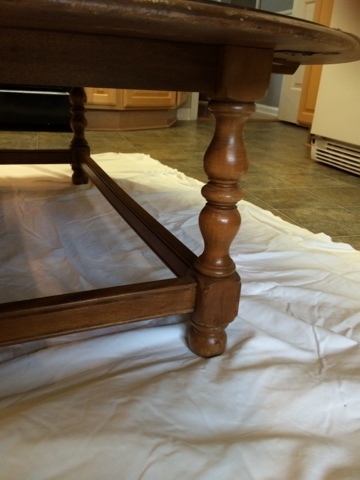 It took two coats to cover the coffee table and I did not use a bonding agent. I don’t own any. 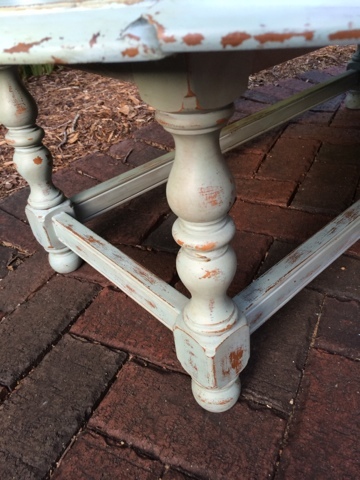 To me, choosing paint for a piece of furniture is all about color. 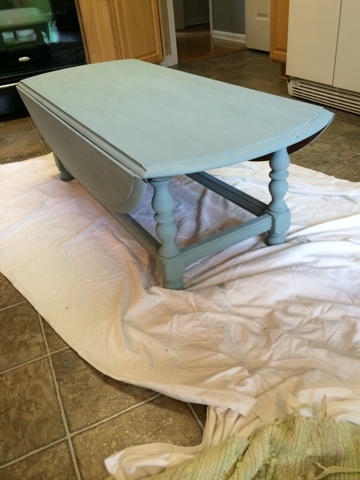 Then I tried Milk Paint and it became all about chippiness! If that’s even a word ! I did not get much chipping at all on this one, which was a little disappointing. But I do own sandpaper. 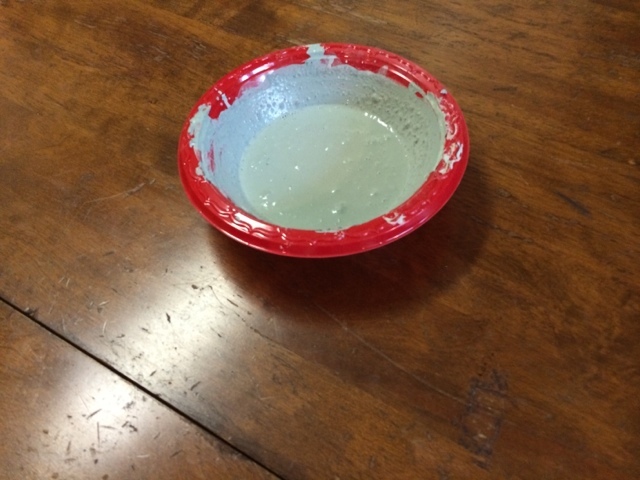 I used 220 grit on the top of this coffee table and took it down a good bit. To me, that would be where the bulk of the wear would happen naturally. I did my wax mix trick again. 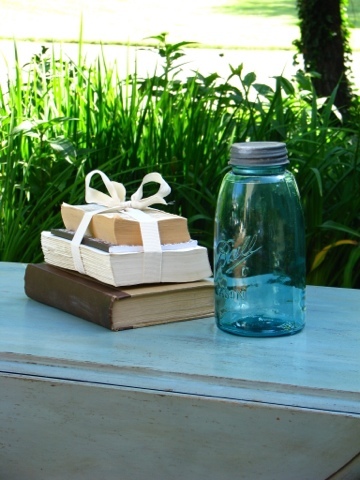 I mixed alot of Annie Sloan clear with a little bit of her dark wax and it worked like a charm. 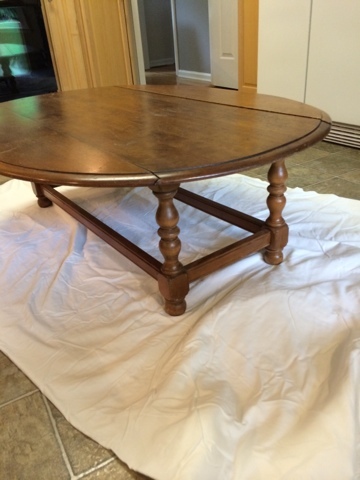 I think this coffee table’s previous owner used this as a workbench and that dark wax settled in to every imperfection! 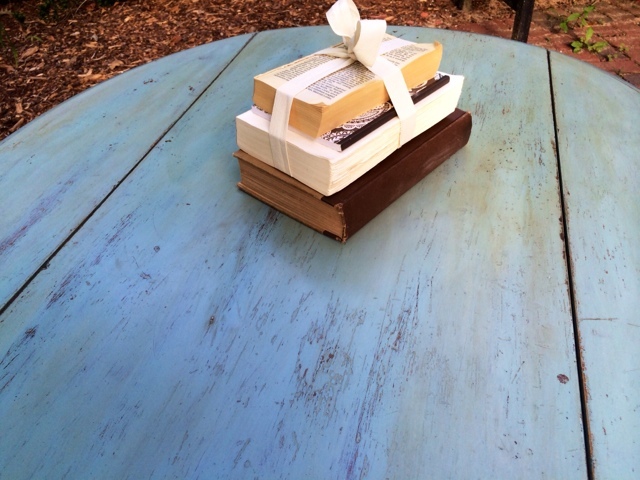 I love these little book bundles. I have a few scattered around my house. This particular one sits on a desk. 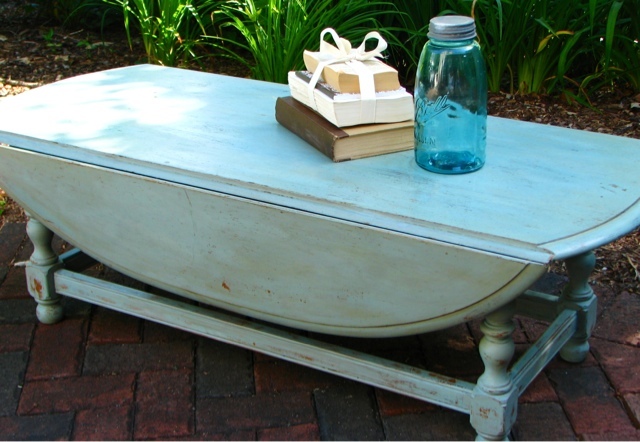 But it’s pretty cute on this coffee table! Barbara, Enjoy your week without the kids. Know that they are probably missing you too but are having an amazing week and are being spiritually nurtured. And yes, puppies and dogs are quite the rescuers. And fyi, that is one of my favorite lines in Pretty Woman, my all-time favorite movie. Paige, your table turned out beautiful. 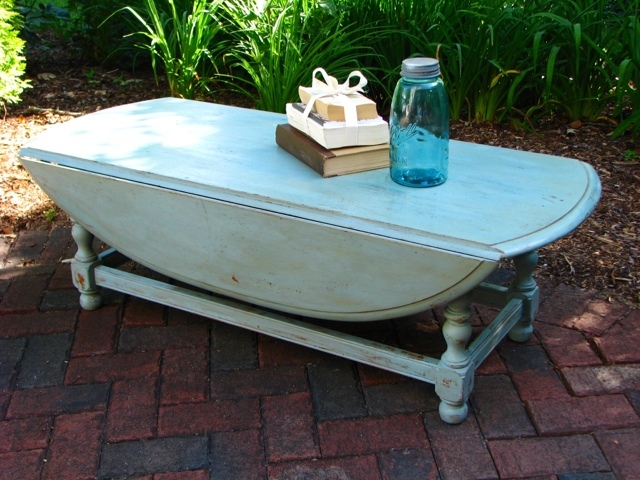 I love mixing Annie Sloan’s clear and dark wax, too. Great job. 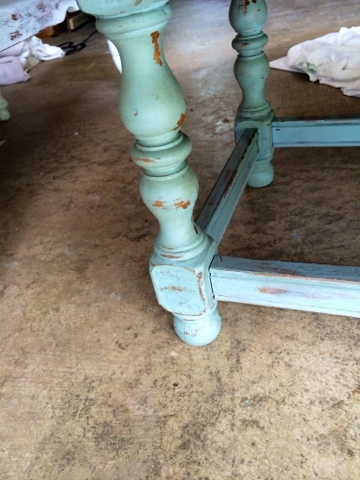 I love that color!….great table and great job by Paige…and enjoy your week Barbara!!! 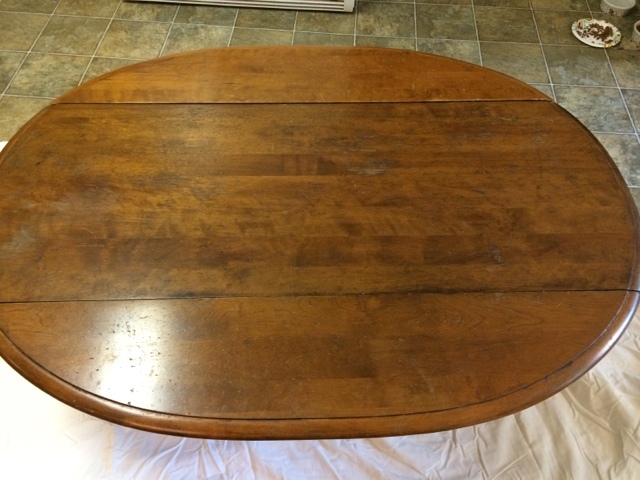 Previous Post Dining Room Table and Chair Sale!